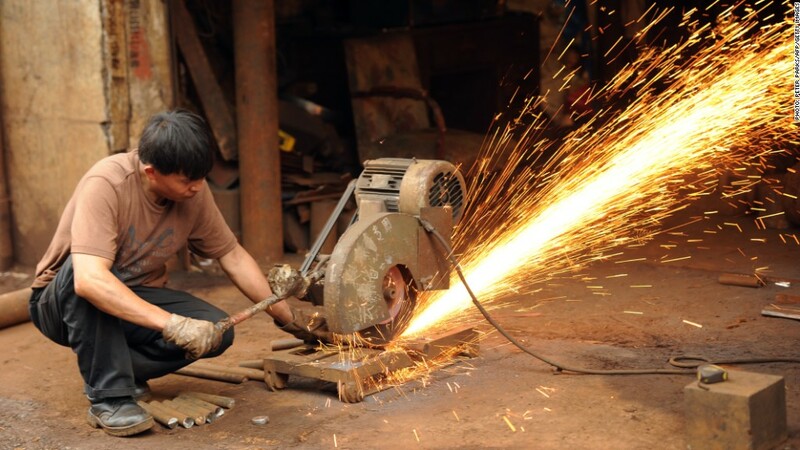 Machinist uses an industrial saw to cut a steel bar at a workshop in Shanghai. More bad news about China's factories: The decline in the country's crucial manufacturing sector got worse last month. A closely-followed report by bank HSBC, released Monday, said export orders for China's factories slid at the sharpest rate since March 2009. And on Saturday, the Chinese government's official manufacturing index fell to 49.2 from 50.1 in July. Any reading below 50 indicates that factory activity is shrinking rather than growing. The fate of manufacturing in China is considered a barometer of the global economy because of the country's role as a powerhouse exporter. China, the world's second-largest economy behind the United States, has been hit particularly hard by the recession in much of Europe. The country has lowered its growth outlook -- and weak manufacturing numbers suggest a return to rapid pre-recession growth rates will take time. Weak conditions in Europe have zapped demand in the eurozone, the largest market for Chinese exports. But many observers worry that the measures have fallen flat, and point to continued weakness in manufacturing and the overall economic activity as evidence. Further stimulative actions are now considered likely. Possible options include a further loosening of reserve capital requirements for banks and additional rate cuts by the central bank.